The FARO Edge ScanArm ES combines the flexibility and the functionalities of a FARO Edge Measuring Arm with the smallest Laser Line Probe on the market, the FARO Laser Line Probe ES. It’s the ideal device for all the users that are looking for an efficient and user friendly solution for probing and scanning tasks enabling to capture materials with challenging surfaces. Click the button below to download the official Faro Edge ScanArm® ES Data Sheet. 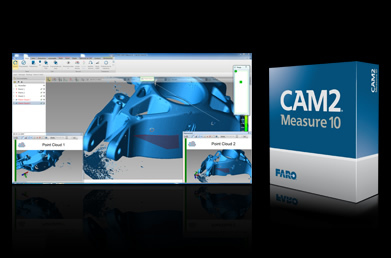 Engineered for maximum efficiency in computer-aided measurement and 3D inspection, FARO® CAM2® Measure 10 Software offers us the flexibility to measure the way your process or job requires. The software is ideal for CAD and non-CAD inspection. CAM2 Measure 10 features image-guided measurement, automatic nominal association to various features. Moreover the software is being used with a reliable CAD import tool which increases the ability to load large amounts of CAD data, which improves our overall accuracy and time to your jobs on time with the highest level of precision.